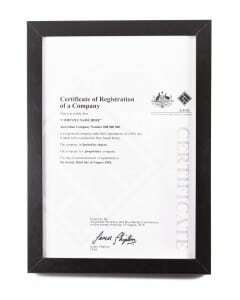 Hang your company registration certificate with pride, and help build trust in your new business. 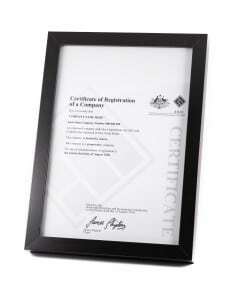 We’ll send you your company registration certificate, printed on quality, heavy stock paper and mounted in a stylish black wooden frame. Made from sustainable Italian timber and hand crafted in Australia, it comes ready-to-display, with a string hanger on the reverse. In the unlikely event your frame is damaged in the mail, we’ll send you a replacement, free of charge. Once your company has been registered with us, we’ll get to work preparing your certificate. It should be on its way by 1pm the next business day. We’ll email you an Australia Post tracking order, so you can follow its progress.